Also on the press-preview menu: venomous lionfish. While animal (and insect) activists might rise up in protest at what was eaten, Explorers Club member Rurka is adamant that this approach is both more attuned to the natural food-chain order of things and a way U.S. states as well as other regions of the world can fight the encroachment of wayward, invasive species. For example, iguanas are causing huge problems now in Florida and Puerto Rico. 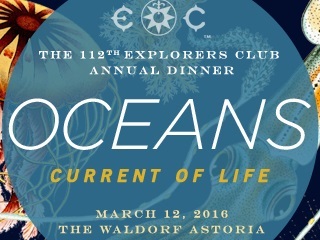 To accommodate some 1,300 attendees, the Explorers Club, headquartered on the Upper East Side, staged the March 12 dinner at the Waldorf Astoria. Read the rest of Swerdloff’s report, which includes many photos, here.